I finally managed to get a card made this evening for the Hope You Can Cling To challenges. This challenge was presented by Lee and here's what she had to say: This challenge is to make a pretty wrapping for a cupcake!!! Whether it's a cupcake wrapper/template or a 3D box or something else....show me what you've got using cupcake images, dp, ribbon, embellies, etc. Now since it just might be a bit tricky to mail these cupcake wrappings....included in the challenge is to make a matching tag or notecard and that is what will be sent to MD Anderson!!!! Make sure you use cupcakes as your theme.....and no stressin'!!!! If you absolutely aren't able to make an actual wrapper/box.....just show off the little tag or notecard!!! I printed off some directions for a cupcake holder, but I'm just too tired and brain dead to try to put together a 3-D thing right now. I still wanted to do the challenge so I made this cute simple cupcake card. 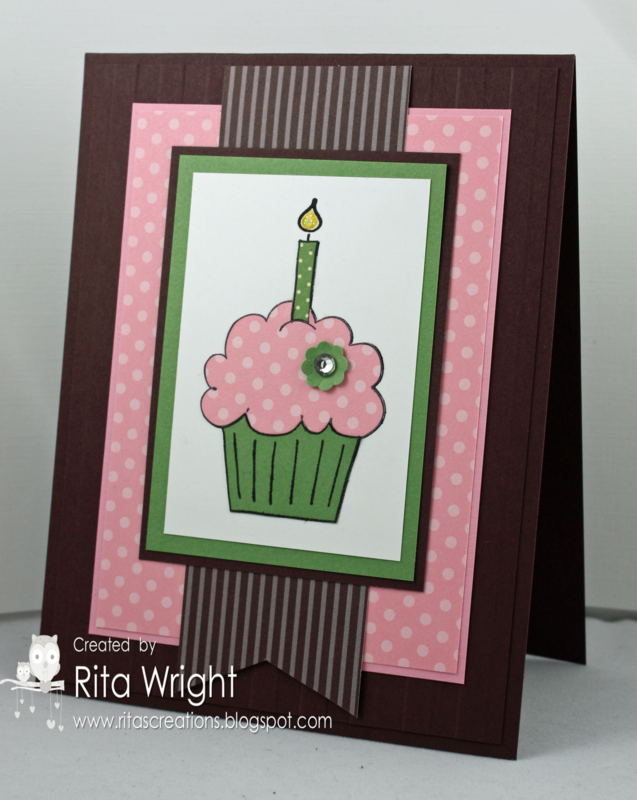 I used some fun colors from the Color Coach and the adorable but retired Crazy for Cupcakes set. I'm starting to like paper piecing a bit actually! Laila just relaxed and blew some spit bubbles as we walked around. Silly girl. I'm loving all the banners I'm seeing around lately. Your card is lovely Rita. Pink and choc looks soooo good together. Gorgeous little Laila - the bubbles made me smile. She's such a cutie. I'm really enjoying watching her grow. It's great to see that you still manage to craft despite how busy you must be these days.